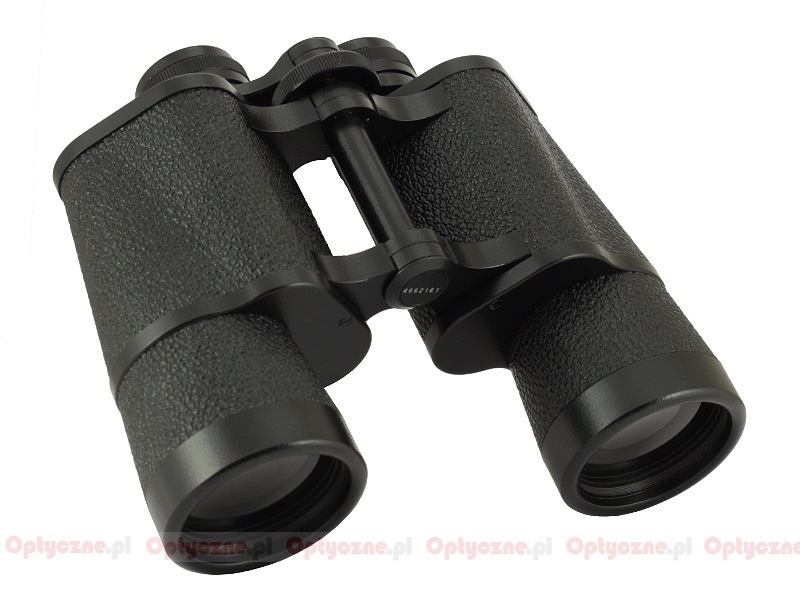 Legendary binoculars - Carl Zeiss Jena Dekarem 10x50 - Carl Zeiss Jena Dekarem 10x50 - 1931-1990 - AllBinos.com . An optical system of almost every contemporary pair of binoculars consists of three parts: an objective lens which gathers the light, a prism assembly, inverting the image and an eyepiece, decisive when it comes to a magnification ratio and a field of view. In a good optical instrument all those three parts cooperate harmoniously with each other, being good optical constructions in themselves. The story of such an interesting and important set of binoculars as the Carl Zeiss Jena Dekarem 10x50 started in the 20s of the 20th century – only at that time all the parts, allowing a construction of such a device, were available. An achromatic objective lens was nothing new as its beginnings go back to the middle of the 18th century. A Porro prism assembly appeared in 1854 but it had to wait for a serious binoculars application till 1894, when the Zeiss company used it for the first time in such an instrument, starting a new era of optical constructions of binoculars. The eyepieces of first prism binoculars featured just two or three elements; as a result their fields of view were quite narrow, amounting to about 50 degrees. The situation changed drastically in 1917, once again due to the Zeiss company or, to be more precise, due to one of their workers called Heinrich Erfle who invented a 5-element eyepiece consisted of two achromatic lenses and a single lens between them. The main flaw of that construction was huge astigmatism; that’s why the Erfle eyepiece wasn’t especially useful at high powers. Still it was its only serious drawback, not especially keenly felt in binoculars which are, after all, low powers devices. The Erfle eyepiece corrected most of optical aberrations well and provided a field of view exceeding 60 degrees; apart from that it also offered a sensible eye relief. The Erfle invention opened up plenty of new possibilities before Zeiss constructors and they were promptly used – soon afterwards several models with a five-element eyepiece constructions were launched, among them the Carl Zeiss Jena Dekaris 10x50, shown to the world in 1929. It was a pair of binoculars with an individual focusing system. The main character of this part of ‘Legendary Binoculars’ series, the Carl Zeiss Jena Dekarem, shares with the Dekaris the same optical construction but in its case it was closed in a casing with a classic ocular bridge and a central focusing wheel. That model was launched in 1931 and was produced, with some small modifications, incessantly during the next sixty years. Carl Zeiss Jena Dekaris 10x50 with individual focusing appeared in 1929. The most impressive feature of both the Dekarem and the Dekaris was their field of view. The possibilities of the Erfle construction were utilized to their maximum and the binoculars offered a field of view of 7.3 degrees. With 10x magnification ratio the apparent field of view of the eyepieces amounted to as many as 73 degrees! In those times it was really a huge achievement; even several years earlier a level of 50 degrees was seen as superb and all of a sudden that value was increased by over 20 degrees. At the beginning the Dekarem was physically heavy, weighing 1350 grams. The change of alloys and the modification of its interior, conducted in 1936, made the binoculars slimmer and lighter, reducing its weight to 890 grams. After the war its weight increased again to 1020 grams – such a value at least was officially given in the old catalogues. The next important modification was introduced by another Zeiss company worker. In 1935 Olexander Smakula, an Ukrainian physicist working in Germany, discovered an important fact: by covering a lens with a very thin layer of a substance which refraction index is in-between the refraction index of air and glass, you can decrease significantly the amount of light reflected from the air-to-glass surface. In such a way the one-layer antireflection T coatings (T meaning here Transparenz) were created and they were applied in binoculars for the first time during the IIWW. Carl Zeiss Jena Dekarem and Dekaris binoculars in catalogue from 1952. After the capitulation of Germany in May 1945 Jena fell into hands of the western Allied Forces; they dismantled a part of the factory equipment and took it to Stuttgart. After a while Jena was included into the Soviet occupation zone and became incorporated into the German Democratic Republic. As part of the World War II reparations, the Soviet army took another part of the existing Zeiss factories and tooling back to the Soviet Union. The remnants constituted a base for the Kombinat VEB Zeiss Jena; the production of binoculars was reinstated soon afterwards. At first their products were few and far between, with some years (like 1948) when literally no pairs of binoculars left the production lines. However, at the end of the 40s and at the beginning of the 50s of the 20th century the company was already working at full capacity and their production volume reached several dozen thousands of binoculars a year. The Dekarems and the Dekarises constituted a huge part of that production being, along with 8x30 and 7x50 models, the core of the company’s offer. The 60s and the 70s saw the peak of that kind of production. As many as almost 200,000 binoculars could leave the assembly lines every year (in 1980, a record-breaking year production-wise, there were actually 470,000 of them) The Jena-produced devices enjoyed a very good reputation around the world. Compared to their western rivals, produced in Oberkochen, they were much cheaper and still they offered very good optical properties; however their price remained the strongest selling point, especially in the Eastern Bloc countries. For example at that time in Poland you could only buy quite average binoculars produced by Polskie Zakłady Optyczne (Polish Optical Works), Russian optics and Eastern Germany Zeiss instruments which offered the biggest possibilities (with an average salary being an equivalent of 10-20 dollars people could hardly afford any optical products “made in West Germany”). The magic reputation, surrounding the ‘Zeiss’ brand name influenced that choice as well and it’s been working that way practically up to now. 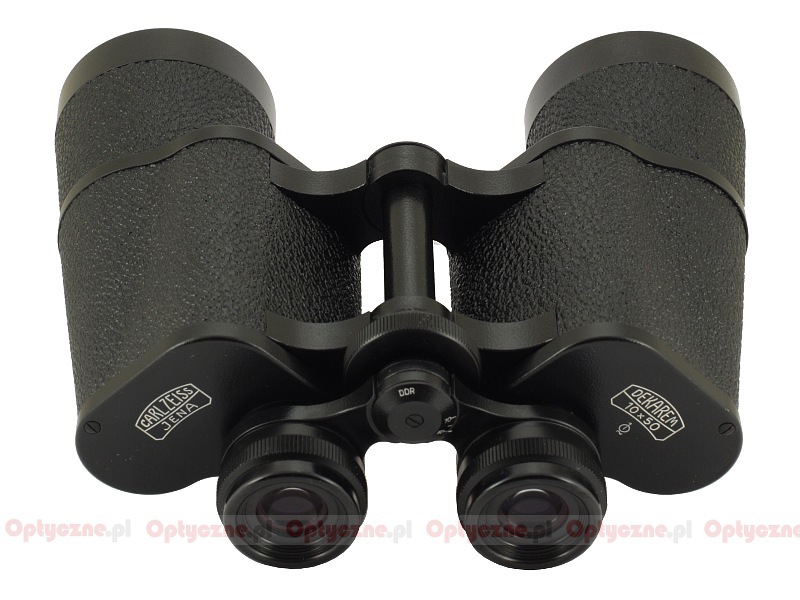 Even today on different auction sites you can find Russian binoculars which are touted to contain lenses produced in Jena even though those claims are not entirely true. The 70s brought two other innovations of the 10x50 model. First of all the multi-layer T3M coatings were introduced. One-layer magnesium fluoride coatings covering the glass elements previously gave blue reflections; the T3M coatings were orange-pink. Their usage resulted in better colour rendition (the image was less yellowish) and increased the transmission level. Carl Zeiss Jena Dekarem 10x50 with soft case and neckstrap and paperwork. Around the same time a new brand name, Jenoptem, was launched, including 8x30, 7x50 and 10x50 models. Even now it is not completely clear how those models differed from similar Deltrintems, Binoctems and Dekarems; still they were by over 20% cheaper, making even more people interested in Jena products; in turn they were fueling even bigger production volumes which, in the 80s, amounted to 100-200,000 of binoculars a year, momentarily even over 300,000 a year. Carl Zeiss Jena Jenoptem 10x50. Some people claim that such mass production had an adverse effect on the quality and Jena binoculars produced earlier had been more solid, with better mechanical and optical properties. Carl Zeiss Jena Jenoptem 10x50 with hard case. 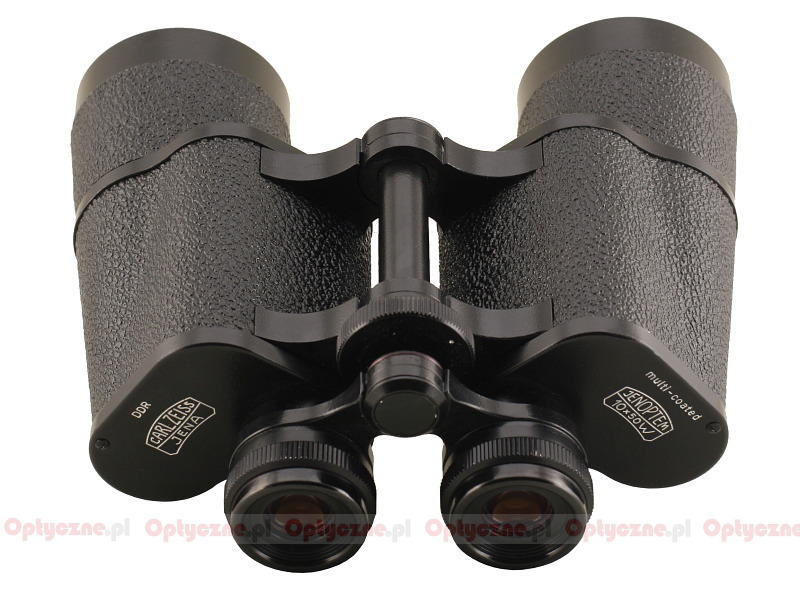 Anyway the Carl Zeiss Jena Dekarem 10x50 (along with its variation called the Jenoptem) was produced till 1990. 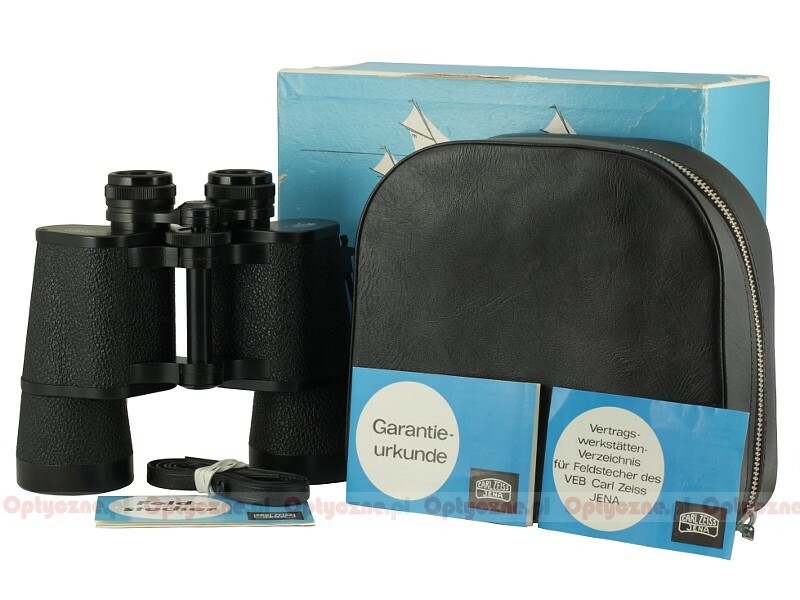 It is possible that even in 1991 some specimens of those binoculars left the Jena factory, along with over 5,000 pairs of other binoculars with the well-known logo. That year, however, the Berlin Wall was torn down and the claims of the Western Zeiss branch, the legal successor of the whole company heritage, made it impossible for the Jena factories to use the Zeiss logo anymore. Still nature abhors a vacuum; almost exactly at the same time the factory was taken over by the Analityk Jena company which continued the production, just changing the name of the binoculars into Docter Optics. At the beginning of the 90s of the 20th century the good, old Dekarem 10x50 could be bought as the Docter Optic Classic 10x50. The change didn’t concern just the logo and the name. 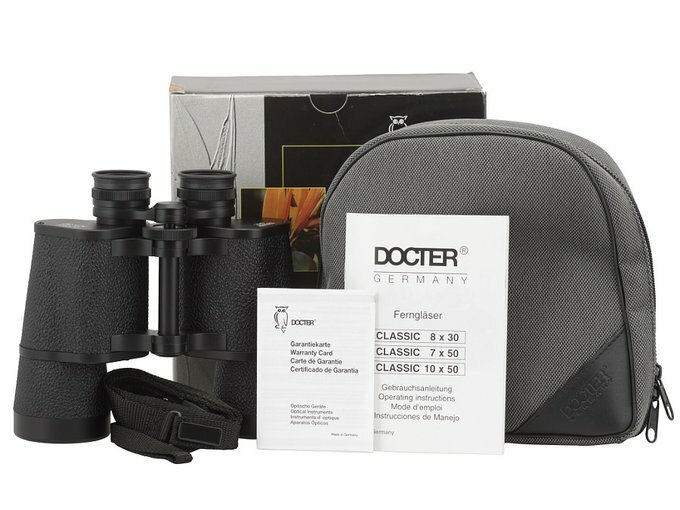 The Docter binoculars got new, much more efficient antirelection multi-layer coatings which improved their optical properties significantly. Also some slight casing modifications were introduced (e.g. rubber eyecups in the8x30 and the 7x50 models). 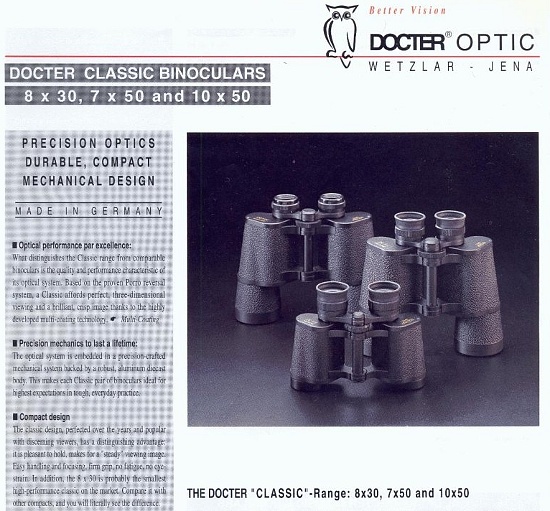 A page from Docter Optic catalogue presenting Docter Classic binoculars. Source: H. Merlitz. The market realities of the Western Europe, higher costs of labour and production connected to, among other things, those improved coatings, made the Docter Classic series also much more expensive. As a result the new models weren’t able to compete successfully with Japanese binoculars. Near 1994 their production finally stopped. It was a sensible decision especially as, at the same time, the Nobilem series models, optically much better and featuring some rubber armour on the casing, hit the shelves - they have been produced and sold up to now. Docter Classic 10x50 with accesories. 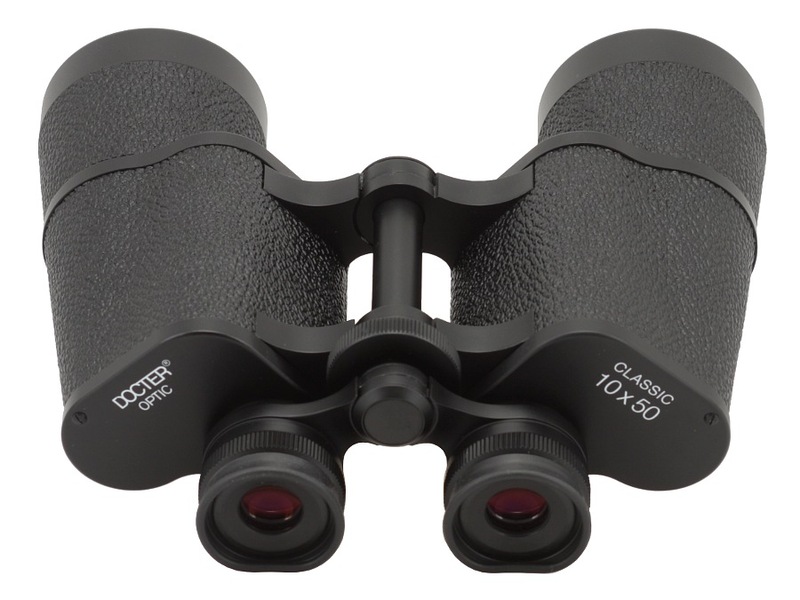 I don’t doubt that the Carl Zeiss Jena Dekarem 10x50 is one of the most important pairs of binoculars in the whole history. The 10x50 parameters are most universal of all imaginable combinations; with such an instrument you can observe birds, you can hunt or admire starry sky, you can also take it on a trip. If you add to that a very wide field of view, good optical properties and an affordable price you shouldn’t be surprised that the model found approximately several hundred thousand of satisfied customers. 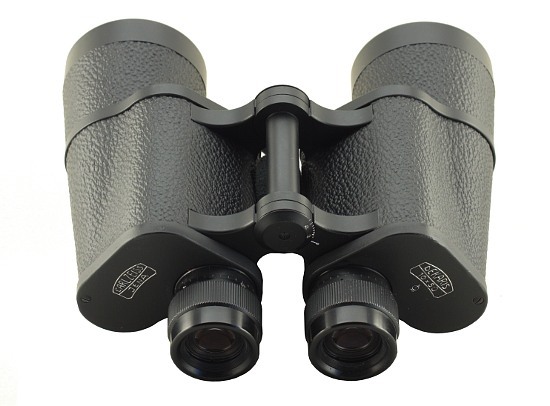 What’s important, many of these customers have been using their binoculars up to now - the Jena products enjoy a reputation of very tough instruments, ones that can serve you several dozen years without any problems. 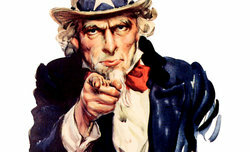 Even nowadays you can find specimens in good working condition on different auction sites and second-hand shops. 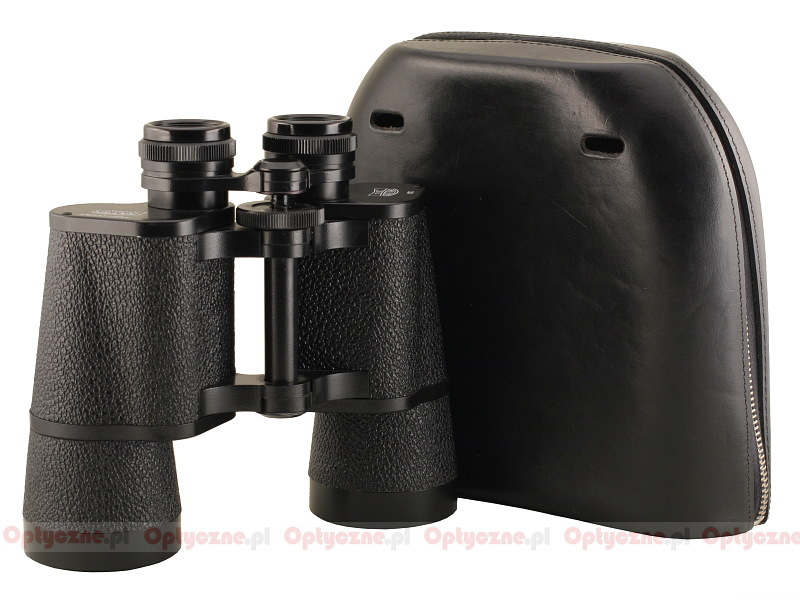 A pair of binoculars in working order but with visible marks of wear and tear might cost about 100-150 Euro; a specimen in very good condition might be worth around 200 Euro but for a collector’s item in mint condition with full accessory set you must pay even over 300-400 Euro. What’s interesting, the prices of Dekarems and other Jena products have been raising steadily on the western markets. There are less and less well-preserved specimens available, the collector’s market is growing and many people are looking for such an instrument because of fond memories connected to their youth and their first pair of binoculars. The fact that the market has been inundated by cheap Chinese production, usually of very poor quality, is also an important factor. Virtually indestructible Zeiss binoculars, perfectly able to work for several dozen years without any problems, are a nice souvenir from those times when the production of such devices was supervised by optics engineers, not white-collar Excel graph specialists, planning how to make their product break down one day after the end of the warranty period. 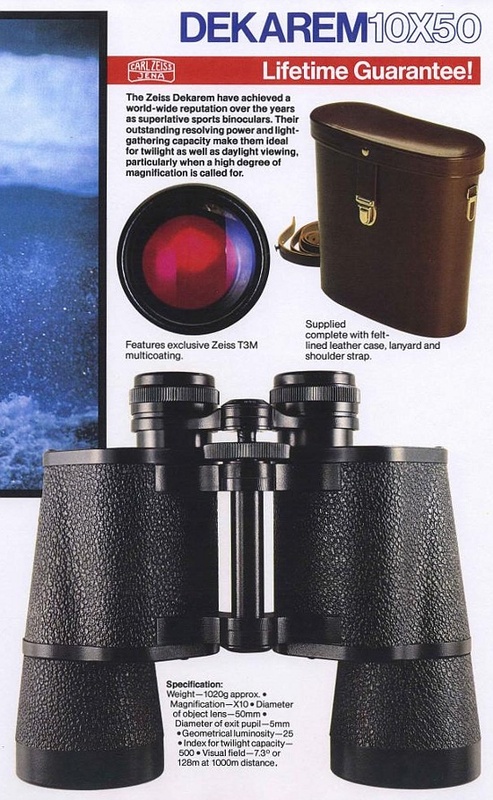 A page from Carl Zeiss Jena catalogue from 1985 showing the description of Dekarem 10x50 binoculars. Source: H. Merlitz.